Have you been there? Are you there now? It’s sometimes a scary thing. Yep. Scary. It’s sometimes a scary thing to be 50 years old and look back over a period of years and wonder, “Did I do well there?” It can be scary at any age! Do you know what I’m learning? It’s okay to look back and ask these questions…but, if you begin to dwell on them you’ll start living in the past. Have you ever tried to drive a car by looking in the rear view mirror? Nope! You can’t! But, you can learn and grow from what’s in the rear view mirror as you look forward! Isn’t that what we’re doing in this life? Living and learning? Yes…as believers…this is boot camp preparing us for heaven! So, can I share with you what I’m learning? I’m learning communication is absolutely vital! If we’re not communicating, we’re going to struggle! That’s the case in every relationship. Home, work, friends, teams. You name it… If we’re not communicating we’ll struggle! We all know that…but it’s so hard sometimes isn’t it! How’s your communication? How is it with your family? How is it at work? Is there a relationship in your life that’s strained? If there is…I’m telling you…I’ll bet you it has something to do with lack of communication or poor communication. And most likely, you didn’t mean for it to happen. It just happened. You got busy. They got busy. Things got complicated. Things happened. Then the communication stopped. Can you pick it back up? Communicate? Hmmm… I know what you might be thinking… “This is going to be tough.” Yep, communicating is scary isn’t it? It’s scary because it means we often have to be very vulnerable. Yet, vulnerability (honesty) leads to good communication. Lack of vulnerability and stonewalling leads to terrible communication…like cold-shoulders, or not being willing to talk about the “elephant in the room” (and hoping it will all just go away). Well, it won’t go away! It never just “goes away.” It has to be addressed…just like a splinter…or cancer…or a bad attitude. It’s got to be addressed. How do we address tough situations in life? Like Jesus…think about it…he had a strong mind and a warm heart. Can you find that balance? Man, I struggle to do that. But, I love the fact that Jesus has given us His Word to guide us to this place. Now, you’re going to want to skip over this passage of Scripture…but, don’t. Please. Please read this passage. I promise it will help. 14 Bless those who persecute you; bless and do not curse them. 15 Rejoice with those who rejoice, weep with those who weep. 16 Live in harmony with one another. Do not be haughty, but associate with the lowly. Never be wise in your own sight. 17 Repay no one evil for evil, but give thought to do what is honorable in the sight of all. 18 If possible, so far as it depends on you, live peaceably with all. You know what I’ve done? I’ve made the commitment to address all that I can address and leave the rest to the Lord. I will talk about the elephant in the room, but I won’t be mean. I will be kind and gentle and seek harmony knowing it can’t always be had. But, I’m only responsible for my response. And you are responsible for your response. It’s true. I can’t live people’s lives for them, and nor can you. But, we can be gracious. Sometimes we just need to realize that we simply might be further down the road on our journey with Jesus than the person we’re dealing with at the time. Yet, in trying to “outdo one another in showing honor,” we can show grace. The difference in the distance between us and them is: “grace.” We show grace to folks. Love. And when we do (and they might even be expecting us to be mean)…then, we’ll see hearts and lives changed. Yep, I’m 50, and I’m learning, and I’m seeking to grow! And I’m seeking to communicate better! And show more grace! Hey…I’m excited to let you know I’m headed to the White House! The family and I are headed up to Lynchburg, VA for a wedding this weekend and from there we’re going to Washington to take Clara and Andrew to see the capital of our nation. They’ve never been to D.C., and we want them to understand the power structure of our nation and the history of our nation. 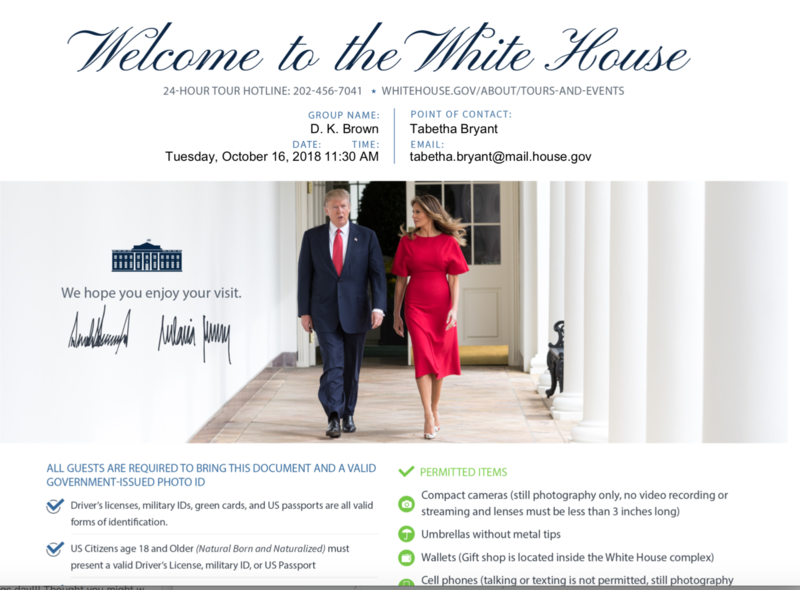 As you can see, we’ll be going to the White House for our 45-minute tour on Tuesday, October 16th at 11:30 am. That will be so cool! We’ll also be going to the Capitol. We’ll do that on Monday the 15th. This is part of a trip that includes a visit to the Bible Museum and some things I’m doing through my “conference/education.” So, we’re killing two birds with one stone. I’ll update you on all the happenings when we get back! Here is this week’s Two-Minute Tuesday: “The Target Audience for Advertisers Today? -A 26-Year-Old.” Are we reaching them?